Our EVH Premium Guitar Picks were hand selected by Eddie from thousands of picks he's used over the years. These nylons picks feature a non-slip grip surface, the classic EVH logo, and a comfortably rounded tip that's just right for shredding Eddie's licks. EVH Premium Guitar picks come 12 per pack in a collectible tin that features the EVH logo and images of his famous Frankenstrat. 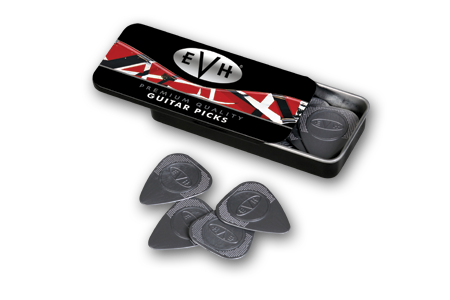 Get more for your money with EVH Premium Guitar Picks. Good picks for the price. They feel good because the picks have a grip on them. The tin that they come in looks really good too. Good purchase and worth the money.